Model This was a rather large musical performed in a small space -- a black box with approximately 190 seats as configured for this show. 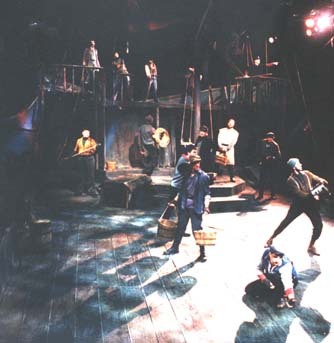 The production called for three major looks -- the deck of the ship (as seen here), the crew quarters "below", and scenes of fishing in small boats on the open ocean. The "below" scenes were done by lowering lanterns and the open ocean scenes with fog and a small boat that tracked in the deck.